To find ratings, traveler tips, maps, and tourist information, you can read our Rovaniemi trip itinerary planning website . London, UK to Rovaniemi is an approximately 6.5-hour flight. You can also drive; or do a combination of car and ferry. The time zone changes from Greenwich Mean Time (GMT) to Eastern European Time (EET), which is usually a 2 hour difference. Plan for a bit cooler temperatures traveling from London in April, with highs in Rovaniemi at 3°C and lows at -3°C. Cap off your sightseeing on the 10th (Wed) early enough to go by car to Akaslompolo. On the 11th (Thu), get outside with Seven Fells Up and then get a dose of the wild on a nature and wildlife tour. For photos, ratings, more things to do, and more tourist information, go to the Akaslompolo trip itinerary planner . Traveling by car from Rovaniemi to Akaslompolo takes 2.5 hours. Alternatively, you can take a bus. In April in Akaslompolo, expect temperatures between 3°C during the day and -4°C at night. Wrap up your sightseeing on the 11th (Thu) early enough to drive to Inari. On the 12th (Fri), surround yourself with nature on a nature and wildlife tour, then see the interesting displays at Siida, and then pause for some serene contemplation at Pielpajarvi Wilderness Church. To see other places to visit, maps, more things to do, and other tourist information, read our Inari trip planner . Traveling by car from Akaslompolo to Inari takes 4 hours. Alternatively, you can take a bus; or take a bus. 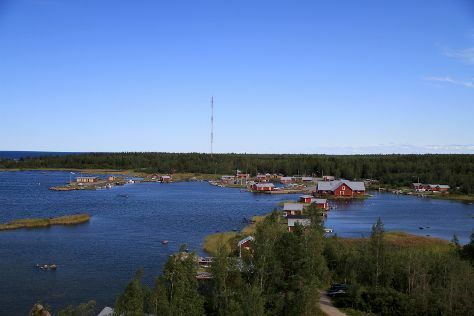 April in Inari sees daily highs of 3°C and lows of -6°C at night. Finish up your sightseeing early on the 12th (Fri) so you can travel to Vaasa. Kick off your visit on the 13th (Sat): head off the coast to Kvarken Archipelago World Heritage Site. To find where to stay, other places to visit, more things to do, and more tourist information, read our Vaasa route maker app . Traveling by flight from Inari to Vaasa takes 6 hours. Alternatively, you can drive; or do a combination of bus and train. Plan for somewhat warmer temperatures traveling from Inari in April, with highs in Vaasa at 7°C and lows at -1°C. Finish your sightseeing early on the 13th (Sat) so you can travel to Kotka. Kotka is a city and municipality of Finland.Kotka is located on the coast of the Gulf of Finland at the mouth of Kymi River and it is part of the Kymenlaakso region in southern Finland. Kick off your visit on the 14th (Sun): take a stroll through Hamina Old Town, identify plant and animal life at Riverside Park, then take a stroll through Linden Esplanade, and finally enjoy the sand and surf at Beach Mansikkalahti. To find traveler tips, other places to visit, where to stay, and other tourist information, go to the Kotka trip tool . Do a combination of flight and train from Vaasa to Kotka in 5.5 hours. Alternatively, you can drive; or take a train. April in Kotka sees daily highs of 8°C and lows of -1°C at night. Wrap up your sightseeing on the 14th (Sun) early enough to drive to Helsinki. Get a sense of the local culture at Sea Fortress Suomenlinna and Ullanlinna. Take a break from Helsinki with a short trip to Nuuksio National Park in Espoo, about 46 minutes away. And it doesn't end there: wander the streets of Katajanokka, take in the spiritual surroundings of Rock Church, pause for some serene contemplation at Helsinki Cathedral, and don't miss a visit to The Esplanadi Park. To see where to stay, traveler tips, reviews, and other tourist information, read our Helsinki trip planner . Traveling by car from Kotka to Helsinki takes 1.5 hours. Alternatively, you can take a bus. In April, daily temperatures in Helsinki can reach 9°C, while at night they dip to 0°C. Wrap up your sightseeing on the 17th (Wed) to allow time to travel back home.